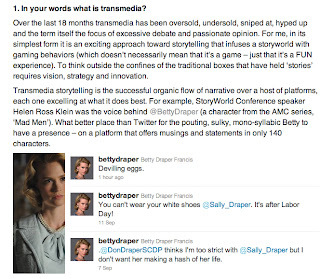 Appropriate that Halloween, holiday for appropriation of fictional identities, is the launch day for Storyworld in San Francisco, the first conference dedicated to the art—and business—of crossplatform entertainment. This ambitious gathering is the brainchild of Alison Norrington, Doctor of Transmedia and founder of storycentralDIGITAL. I look forward to tales and insights from the trenches shared by luminaries like Jeff Gomez, Ivan Askwith, Mike Monello, Frank Rose, Liz Rosenthal and other cross-platform players from around the world. 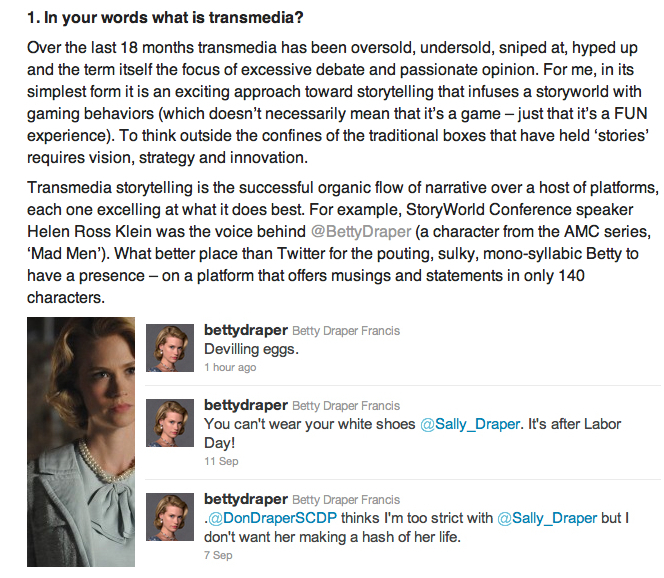 Thank you, Alison, for citing Betty Draper in your definition of transmedia storytelling. If you haven't already found him, the Bitchy Waiter blog has an alternate persona as the Frazzled But Happy Stay At Home Mom. 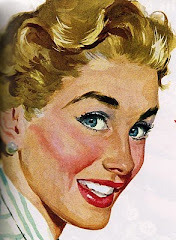 She reminds me of @bettydraper.